Bag lots of bargains at the NCT Nearly New Sale. The first 150 through the door will receive a free goody bag! Stalls will be packed with clothes, toys, nursery items and prams to name but a few items. 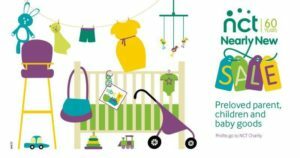 Entrance is £1 for adults, payable on the day and remember if you are a NCT Member you can gain access to the sale from 9.45am, but you must have your membership card.